The SN1 mechanism is similar to SN2 in that you get a substitution product, but the path to get there is completely different. It’s important that we understand how it’s different from SN2. All right guys, so now we're pretty much pros at the SN2 mechanism. But it turns out that not all substitution reactions proceed through the SN2. There's actually another mechanism out there that also produces substitution at the end and that mechanism is called SN1. If I were to just generally paraphrase what SN1 is I would say the following sentence. What you're going to notice is that quite a few of the keywords that we use for SN2 are going to change. What it is is that a neutral nucleophile, so that's a big deal, neutral, is going to react with an inaccessible leaving group. What am I talking about here? Well, neutral means that – remember that SN2 is negative. So this one means – neutral, it's not going to have that strong nucleophilic property. Inaccessible has to do with R groups. So we're going to get there in a second, but you can already start to think, that must mean that there's a lot of R groups maybe. That's going to produce substitution in two steps. So what you can see is that in this sentence almost every word has changed except for substitution. What that means is that at the end I still get a very similar product, which is a substitution product, but all of the conditions have pretty much changed. Now instead of being negative, it's neutral. Instead of being accessible, it's inaccessible. And instead of happening in one step, it's going to happen in two. Let's just go ahead and start breaking this mechanism down. The biggest thing you're going to notice that's different about the SN2 versus the SN1 is that my nucleophile looks totally different. Before, my nucleophile was the initiator in the reaction. My nucleophile was like the arrow. It had a very strong negative charge and it was looking for any back side to react with. If I draw that same first step here, that's a huge mistake. Do you know why? Because this is not negatively charged, so it's not very nucleophilic. It's not looking for a back side right now. In fact, it's happy. It's neutral. So the nucleophile is just chilling. To just draw it going to the backside would be a huge mistake. That nucleophile is chilling. It doesn't need to do anything. It's neutral. That means that the first step must be something else. It turns out that the first step is going to be very unusual. And I know that it's going to be weird, so I'm just going to try to get it over with. It's that the X or the halogen, the leaving group, is going to take off all on its own. This is weird because every since I've been teaching you about mechanisms, I've always said that you make a bond first and then after you break a bond. But here, what I'm doing is I'm breaking a bond without making one first. I'm just breaking it by itself. Why is that possible? How does this even make sense? Unfortunately, I don't have another reaction in organic chemistry that I can compare this to. We've never done this before. But if you think way back, when you took gen chem two, we actually do know a reaction that was similar to this. I'll try to make the explanation quick because I know you barely remember gen chem two probably. Remember when we were thinking back on acids and bases and we learned about titrations. And we talked about how pH had to do with the amount of hydrogen ions you had and the OH ions. What we learned is that the Kw of water, the dissociation constant of water, was 1 x 10- –do you guys remember? It's been such a long time. Negative 14. What the hell does that mean? What that means is that water is normally H2O and that's the way it's happy. But for some random reason, one out of every 100 billion molecules is going to decide to just split apart on its own and make H+ and OH-. For a split second it's going to do that. And guess what's going to happen? It's going to hate its life because now it's two ions and it's way less stable. Then it's going to come back together. This is a random process that's happening all the time. You could almost think of it like a divorce, but then they get right back together because they realize that they actually like each other. In the same way, alkyl halides have a dissociation constant as well. So I'm going to put here KRX. But that dissociation constant is actually going to be a lot higher. Why? Because water is very unstable after it dissociates. But alkyl halides actually already have a really strong dipole. Then on top of that, the bond, the carbon-halogen bond is actually a very, very weak bond in comparison to the water. What that means is that it's actually going to be easier for the alkyl halide to dissociate than water will be. I don't know the exact number. I'm just to make one up. Let's say that instead it's 10-7. Remember that this is on an exponential scale so that doesn't mean it's twice as good. That means it's like a million times as good. All I'm trying to say is that this is going to wind up giving me ions as well, but at a better rate than I would usually get for – or a better equilibrium than I would usually get for water. What that means is I'm going to wind up getting C+ and I'm going to wind up getting X-. That's what's happening here. All I'm trying to say is that random processes are going to drive my alkyl halide to ionize and that's always going to be the first step. What that means is that my nucleophile's chilling. It's neutral. But now, for some reason, my alkyl halides going to ionize by itself. What that's going to give me is a positive charge and a negative charge. The positive charge is what we're going to call our carbocation. Now what our carbocation is going to look like is it's going to be this carbon right there. I'm just going to draw that carbon, but now it's only attached to three things. It's attached to an H. It's attached to an ethyl group on one side and it's attached to a methyl group on the other. Now this carbon wants to have four bonds, but it only has three, so it needs a positive charge. Now do you guys remember what the hybridization in geometry was of a carbocation, three bonds? It should be – I'm just going to write here. It's going to be Sp2 because it only has three groups or three bond sites and it should be trigonal planar. I'm going to put TP but that's just going to mean planar, trigonal planar. Notice that before I had my methyl on a wedge and my hydrogen on a dash. You can't draw it that way anymore because trigonal planar means it's all on the same plane. So it's actually wrong to draw it that way. Now we have to draw everything with a stick on the plane. Is that cool so far? This is what's called our carbocation intermediate. And this brings us to the concept of transition state versus intermediate. Remember that the middle step of an SN2 was to make a transition state. Well, in this case, for an SN1, your middle step is an intermediate. What does that mean? You actually can isolate this. This is the molecule that it's not very stable, but it actually can be isolated and I can make some of it. I can make carbocations and I could keep them in a test tube and I could keep them for a little bit. Now I have my carbocation intermediate. What the next step going to be? Is it just going to end there? Obviously not. The next step is going to be that now I have my weak nucleophile that was just chilling, but now I have a very strong electrophile. A carbocation is one of the strongest electrophiles possible. When my nucleophile sees that, you know what, it might not be negative, but it has electrons, so then it's going to go ahead and attack the carbocation. So in the second step, my nucleophile comes and attacks. But now I have a question for you guys. Do I have a front side and a back side that I have to worry about? No, because it turns out I don't have a halogen attached anymore. Remember before I always had my halogen attached so I could only go from the back, but now all I have is this planar structure that I could either attack from the front or from the back equally. It doesn't matter which one. So that means that I have two different ways that I could attack. I could either attack from the back or I could attack from the front. And that could lead, if I have a chiral center, that could lead to two different products. What that means is that – by the way, is this chiral? Yeah, it is. It's the same compound as before. So what that means is that I could get the example where my – basically, where my nucleophile is here, but everything's exactly the same. What that means is that the chirality doesn't change at all. That's if it let's say attacked from the front because it's just – basically, it's attacking from the same side that the X attacks from or that the X left from, so basically the X was here, my nucleophile attacks from the front, so it attaches to the same place. But the other product that it could give me is the back product. So what it could also do is it could attack from the back side, which means that the nucleophile would be attached to where the ethyl group used to be. And what that means is that I would get the other chiral center. Is there a way to determine exactly which one I'm going to get? No. It turns out that because this is trigonal planar, it's actually a 50/50 shot. I have 50% chance that I'm going to collide into the front. Remember this is just based on collisions. I also have a 50% chance that I'm going to collide into the back. So what that means is that I know that I'm going to have more than one enantiomer possible if it is a chiral center. We're going to hold that thought and I'm going to keep on explaining more things about this reaction, but I just want you guys to see how that is right now. Is there anything else that I should draw? Yes, remember that there's going to be the X and the X is going to have a negative sign. Notice that my product came out similar to the SN2. I'm going to get substitution at the end. The only difference is that I have some differences with the arrows first of all. The arrows are completely different. And my stereochemistry seems a little bit off. So we're going to go ahead and talk about that in a little bit. Summary: A neutral nucleophile reacts with an inaccessible leaving group to produce substitution in two-step. Concept #2: Why highly substituted leaving groups favor SN1. Now what I want to do is talk about the inaccessible leaving group part. That has to do with R groups and it has to do with carbocations. So basically, there's this trend about carbocation stability that says that the more R groups that you have directly attached to a carbocation, the more stable it's going to be. It turns out that since you need carbocations in order for the nucleophile to attack it, that means that the more R groups I have on my alkyl halide, the better it's going to be. So what that means is that a tertiary alkyl halide or a tertiary halide is going to be way better at this than a primary. I'm just trying to point that out because a tertiary will be the one that's the most stable. Then this would be the side that's the most instable. It should be unstable, I'm sorry. Not instable. Oh my gosh. Don't worry too much about this other stuff in the middle. I'm going to go through a much more robust explanation of carbocations in a little bit. But for right now just know that the more R groups, the better. The less R groups, the worse. The slow step of this mechanism is the formation of a carbocation intermediate. These types of intermediates are unstable, so anything that we can do to stabilize them will help them form faster. -R groups stabilize carbocations through a phenomenon called hyperconjugation. Meaning that the more substituted the carbocation, the more stable it is. Concept #3: Understanding the properties of SN1. So now let's go over our facts, OK? As you can already see this is going to be interesting I got an interesting explanation for you guys, so should the nucleophile be strong or should it be weak? It has to be weak, the reason is because if it was strong it would do an SN2, it would do a backside attack but since it's weak it's not going to do anything it's just going to chill and wait around for something to happen, OK? Should may leaving Group be unsubstituted meaning no R groups or highly substituted meaning lots of R groups? Highly, right? Because we just said that the more R groups you have the more R the more stable your Carbocation will be and the Carbocation is going to be part of the mechanism so you want a more Carbocations, alright? Cool. Is the reaction co-ordinate going to be a transition state or an intermediate? It's going to be an intermediate this time because I have distinct two different steps, OK? So what that means the thing in the middle I could actually stop there if I wanted to and leave it there but then later on I probably don't want to keep it there so that's why I'm going to go all the way to completion that means that is that concerted? No it's 2-step, OK? Now I do want to show you guys that we actually have 2 different steps in terms of.... Well you know I'm going to get that in a second let's just keep going to the rate part and then I'm going to explain that, OK? So now the rates, should be unimolecular or bi-molecular? Well it turns out that the name itself tells you the answer to this SN1 I'm not going to write out the whole thing but it stands for substitution nucleophilic and then unimolecular, OK? So that's what SN1 means but how does that actually make sense so let's go ahead and circle that, OK? The only way to really know what that means is to think back at the way the mechanism works, OK? And it turns out that in this mechanism there is a slow step and there is a fast step and the rate of your overall product is going to be determined by the rate of your slow step, kind of like you're only as strong as your weakest link I know it's a common phrase same thing you're only as fast as your slowest step, alright? So let's pretend that we owned a theoretical company we're going to go into business together, alright? 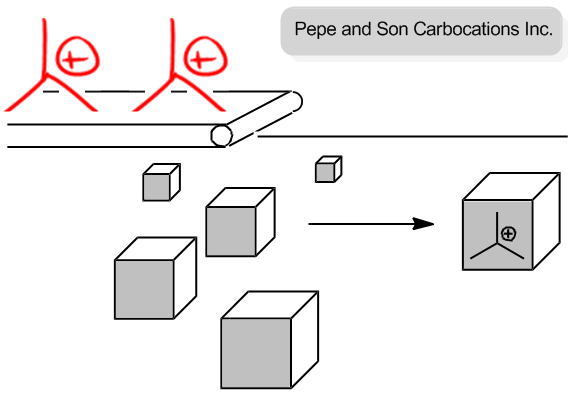 And where we're Pepe and son Carbocation our whole entire product is just to put Carbocations inside of boxes and we sell people Carbocations we're going to make lots of money, you excited about this business? Cool, me too so this is really the cool best thing about this business is that there's only 2 things that we need the only things we need is Carbocations which come on this conveyor belt, OK? And then the other thing that we need is just boxes, OK? So basically, I'll make the Carbocations and you make the boxes and then at the end we'll sell these Carbocations for a lot of money, are you cool with that business strategy? You might want to change the name but the business sounds pretty good, alright? So I'm going to make Carbocations, you're going to make boxes now let's talk about ways that we could maybe get out more product and make more money so how about if you make 100 more boxes and then I make Carbocations so what if I go ahead and I'm making these Carbocations one by one and you decide that you're going to just like try to increase our sales and just make like a 100 more boxes is that going to increase the amount of products that we sell at the end? And the answer is no because this conveyor is going at a constant speed and these Carbocations are dropping into the boxes, alright? So even if I have a 100 more boxes here and this is...Wow I'm really bad drawing at cubes, OK? Even if I added a 100 more boxes here with that change the amount of products that I get? No because I'm still waiting for the Carbocations to drop one by one, OK? So what that means is that the slow step or the rate determining step here isn't how fast you can make a box it's how fast the conveyor belt can drop a Carbocations into the box, alright? Now let's ask the other question, OK? Let's say that I were to.... And by the way let's also pretend that there's a lot more boxes than there are Carbocations, OK? Because like I said the boxes are easy to make, OK? So what if I were to double the speed at which the conveyor belt drops Carbocations would that increase the rate of my production or make more money? Yes it would because again we're assuming that the box is the easy thing to have so you have tons of extra boxes but the Carbocations are the slow step so if I were to just speed up the rate by 2 letÕs say now I have twice as many Carbocations now I'm going to make twice as many products because of the fact that the box is the easy part the hard part is making the Carbocations, are you guys kind of getting that? That's the whole concept of rates determining step and in this case the rate determining step is the Carbocations been generated, OK? So what that means is that my nucleophile was the box was the weak nucleophile was the box, the leaving group is what makes the Carbocation, OK? So if I increase the concentration of nucleophile basically saying let's say that I double the amount of boxes that I have or double the amount of nucleophile the weak nucleophile, is that going to increase my reaction? No, how if I double the amount of leaving group? Yes that's going to increase the rate because the leaving group is what turns into a Carbocation if I have twice as much leaving group that's going to mean twice as much of a possibility that my leaving group randomly dissociates and makes a new carbocation, is that kind of making sense? Alright so what that means is that the rate constant is going to be just the dissociation constant times the Alkyl halide not times the nucleophile because the nucleophile doesn't matter like I said the nucleophile is just like the boxes I have tons of extra boxes if I increase the amount of boxes that just means that I have boxes lying around it doesn't mean that I actually make more product, OK? But if I increase the amount of my Alkyl Halide that's like me speeding up the conveyor belt because now I'm going to make more Carbocation than before, cool so that means that if we were to use this information on the top what I would say is that the first step is my slow step, OK? And then I would say that the second step or the attack is my fast step, the fast that is my carbocation getting attacked that's easy to do, the hard part is making these Carbocation, OK? I hope that my analogy didn't confuse you guys more I'm just trying to show us the difference, OK? So now what's the stereo chemistry? Is it going to be inversion, retention or racemic? The answer is racemic, OK? The reason why the answer is racemic is because like I said this is trigonal planar, the intermediate is trigonal planar so I owe a 50 percent shot of hitting the front, OK? And I've got a 50 percent shot of hitting the back, OK? And in this case one of these is going to be R, one of them is going to be S this would be R this would be S I have to racemic mixture so I would just get even in the enantiomers of both, OK? And that's also very important to remember SN1 and the nickname for this is it's going to be a weird nickname but it's called solvolysis, OK? The reason is because our neutral nucleophile are usually just going to be solvents, the most common neutral nucleophile just so you know are going to be water, alcohol and amines or ammonia, OK? These are going to be our most common reagents that we use as nucleophile as you can tell these are not very strong nucleophile but these are all typically solvents that wind up breaking, solvolysis literally means that the solvent is breaking apart and that's what winds of happening after reaction, OK? You are a manager at Pepe and Son Carbocations Inc, and your boss has asked you to increase production of your product (carbocations in a box- these are awesome). You have plenty of boxes, but it takes time for the conveyer belt to crank out these custom carbocations. Will increasing the number of boxes increase the amount of product? Will increasing the speed of the conveyer belt increase the amount of product? The product must be a racemate if the original leaving group is located on a chiral center. NOTE: Substitution reactions with neutral nucleophiles require an additional deprotonation step. What set of reaction conditions would favor an SN1 reaction on 2-bromo-3-methylbutane? a)Strong nucleophile in a protic solvent. b) Strong nucleophile in an aprotic solvent. c) Weak nucleophile in a protic solvent. d) Weak nucleophile in an aprotic solvent. Draw the reaction mechanism and the energy diagram for the following substitution reaction. Indicate if it follows an SN1 or an SN2 mechanism. Assuming that the rate-determining step in the reaction of 2-methyl-2-butanol with hydrogen chloride to give 2-chloro-2-methylbutane is unimolecular, write an equation for this step. Use curved arrows to show the flow of electrons. Draw the mechanism for the solvolysis of (R)-3-iodo-3-methylhexane in water, leading to a neutral organic product. Show all lone pairs, formal charges, and (where appropriate) stereochemistry. Rank the following molecules in increasing order of susceptibility to an SN1 reaction. Complete the following mechanism for an SN1 reaction that occurs when 2-chloro-2-methylbutane is heated in water. NOTE, ALTHOUGH AN E1 PROCESS WILL ACCOMPANY THIS SN1 REACTION, WE ARE ONLY INTERESTED IN THE SN1 MECHANISM FOR THIS PROBLEM. Use appropriate arrows to show all movement of electrons, show all non-bonding electrons as dots and show any formal charges. If any of the species are really racemic mixtures of enantiomers, you only need to draw one stereoisomer and write "racemic". In the boxes provided, write which kind of mechanisitc element is being shown for that step, i.e. "make a bond", etc. Listed below are several hypothetical nucleophilic substitution reactions. None is synthetically useful because the product indicated is not formed at an appreciable rate. In each case provide an explanation for the failure of the reaction to take place as indicated. A) Provide structures in the box to complete the Lewis acid-base reaction. B) Create the electron arrows needed for the reactants to produce the product. Provide the major product for the following reaction. Compare the following reactions and decide which reaction in each pair would occur faster. Write your answer and concisely defend your choice. No reasoning, no points. Draw the structure(s) of the product(s) that you would expect from the following reaction. For each of the following sets of molecules, CIRCLE the set that will undergo an S N1 reaction faster. If both react equally fast, CIRCLE BOTH. Using arrows to show the flow of electrons, write a stepwise mechanism for the reaction given below. Furthermore, draw a structural representation of the latest (also known as the most product-like) transition state structure with consideration of each elementary steps in the reaction mechanism. Hydrolysis of 2-bromo-2-methylpropane (tert-butyl bromide) yields 2-methylpropan-2-ol. (CH3)3CBr + 2H2O → (CH3)3COH + H3O+ + Br -Give the SN1 mechanism. Draw structures - including electrons and charges and add curved arrows. Which of the following molecules is expected to selectively NOT participate in Sn1 reactions?